Featuring a fast-acting, micro-fine formula that’s powered by advanced anti-wrinkle skin care technologies, this ‘next-generation’ moisturiser helps to balance, detoxify and improve skin health, imparting moisture to the dermis while allowing skin to breathe. Delivered via water-in-oil emulsion technology, the radiance-boosting formula sinks into skin almost instantly to plump, calm and hydrate. 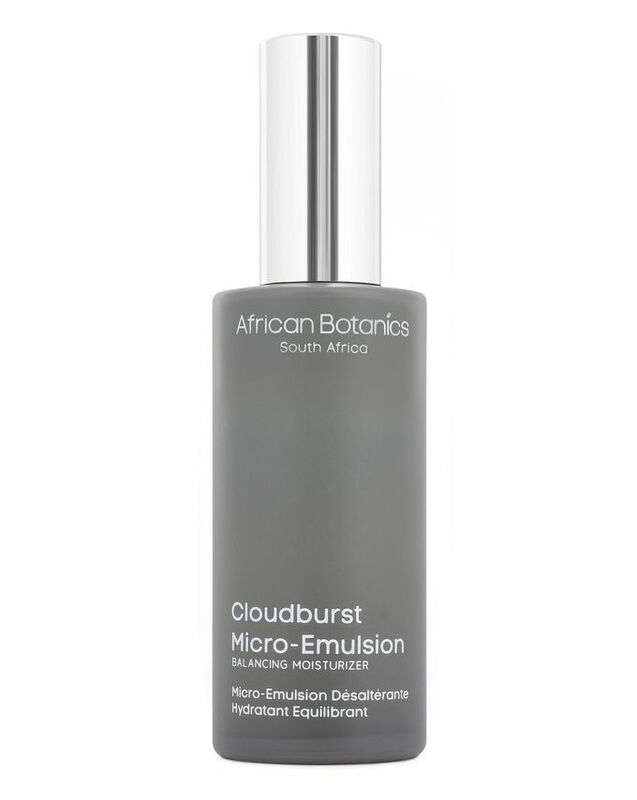 Cloudburst Micro-Emulsion Balancing Moisturizer by African Botanics is crafted from a radiance-boosting formula that’s supercharged with powerful antioxidants and resilient, wild-crafted botanicals that address the first signs of skin ageing, dehydration, dullness, sagging, stress and fatigue. It’s rich in biologically active oligosaccharides – unique molecules that provide a gentle, natural alternative to retinols – to visibly reduce the depth of wrinkles while protecting and repairing skin cells. Also enriched with copper and plant peptides, it detoxifies skin, penetrating deeply to deliver intense, continuous moisture, while also battling breakouts and skin oxidation. Apply daily to face, neck and décolletage after serums. Add additional layers to plump and prime the skin for makeup. Skin Type: This formula is very cooling and calming to the skin and can be used all year round. Ideal for all skin types including those that are exposed to urban pollution, humidity, harsh/dry climates and is recommended for dull, oily, unbalanced, acne-prone, congested, blemished and sensitive skin with inflammatory flare ups. For dryer skin it can be layered with face oils and balms.